The earlier CM7 Alpha 1 and Alpha 2 builds were quite buggy and not really ready for primetime use, but the latest CM9 release is a whole "*two* CyanogenMods better", bringing Ice Cream Sandwich goodness to the Touchpad. However, CM9 is still Alpha 0, which means "'zero hardware-accelerated video', 'zero camera', and 'zero support!'". In addition, the audio "is a mess", the microphone does not work, market filters prevent some apps from being installed, Titanium Backup crashes the kernel, some older hardware problems from CM7 still exist, and traditional storage mounting is not supported. Whew! So, if you want a seamless, unfettered user-experience we would recommend looking elsewhere. But, if you don't mind a challenge then head over to RootzWiki and read through the detailed instructions for installing CM9 on your Touchpad. 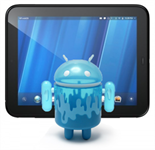 The CM team has also been kind enough to release all the CM9 source code for the HP Touchpad. So, if you want, you can build CM9 from scratch all by yourself. Now that the source is open we would love to see fellow developers contribute bug fixes and improvements. This is something that does not happen enough in the Android world and we'd love to change that trend. Please feel free to contact us in #cyanogenmod-touchpad to get involved and to discuss current and future developments. Although HP has continued to release updates for its now discontinued Touchpad, the Android faithful among us are glad to have the CyanogenMod team on the job.